I’ll probably reload someday because I have quite a bit of brass. Stuff like this scares me though. Funny how he can just dust that ACOG off and put it on a new rifle. No surprise there though, you get what you pay for. The shooter is apparently OK. I only reload straight cased ammo for handguns. It is fairly simple and if precautions are taken, rather safe. I missed the comment, Miguel and would really love to see it. Email me? Was it the Brady Clippy still on your site? Just follow the directions for the loads and it’s perfectly safe. I tend to go slow and weigh my powder twice with my setup. 2. That ammo isn’t “hot” enough so you so you want to add a little “oomph” to it that is way beyond the max charge. Reloading is perfectly safe IF one knows what one is doing. 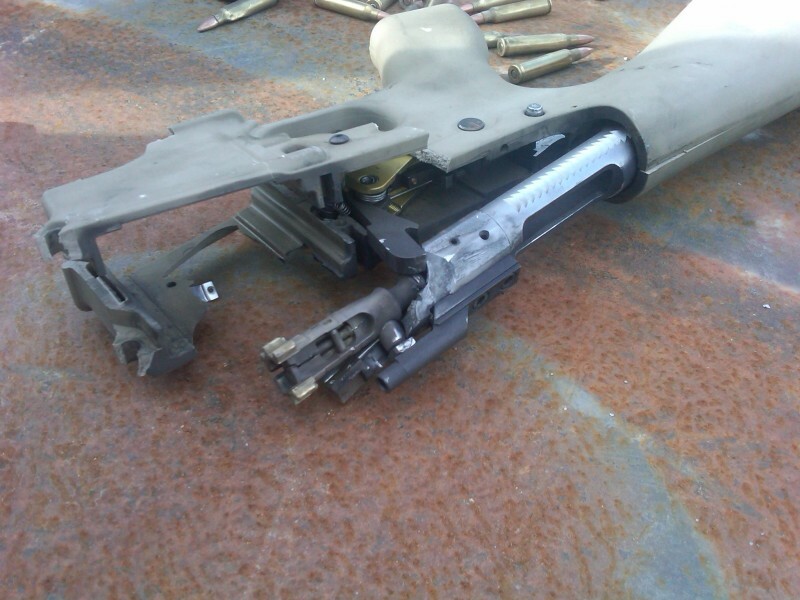 I’m thinking that the owner of this ex-AR was not strong in the force. Is that one of the Cavalry Arms CAV-15 MkIII polymer lowers? I wonder what the damage would have been to a standard lower. I’m sure the Cavalry Arms lowers are well build but I can’t help but wonder if, in this case, it posed more danger to the operator. Aluminum may have been less safe actually because when it exploded it would have probably fragmented more. 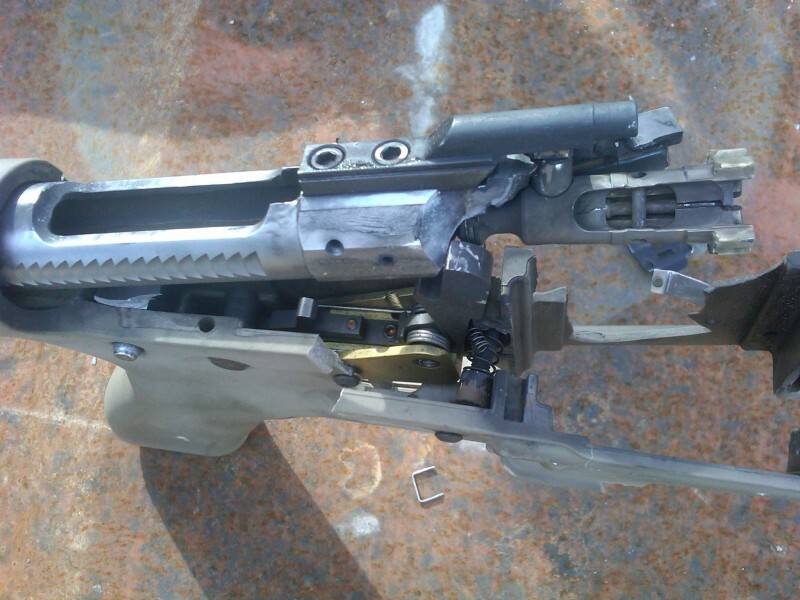 This cav arms one seemed to just crack (except for the one part of the magwell), which was probably a blessing. I enjoy reloading. 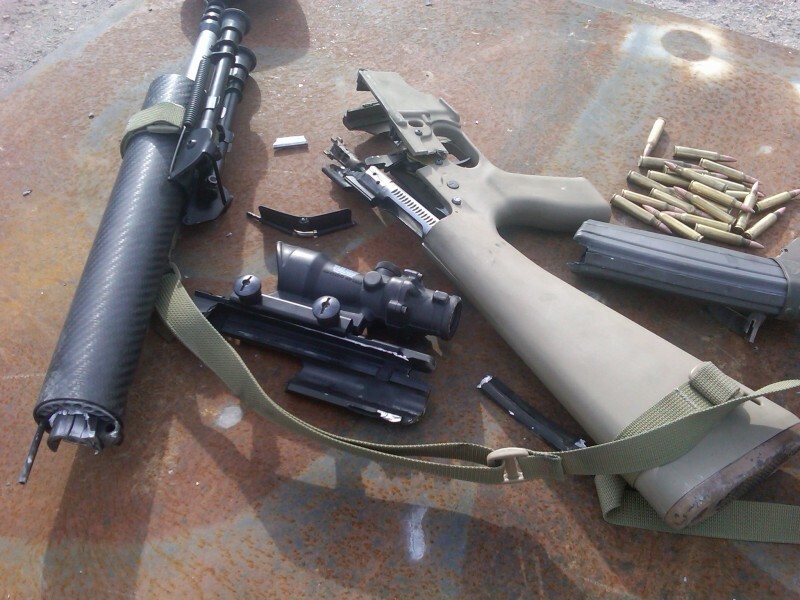 I reload 7.62×51 for hunting and fun shooting. I reload .223 for hunting and fun shooting. Oh hell, I reload because it’s fun. .223 reloading is a little hard to justify. There isn’t any performance gain that I’ve seen. The steel cased stuff shoots just as well as my plinking loads and the match stuff shoot better than my best loads. It’s marginally cheaper and I hate getting rid of brass so it treats some of my mental issues. Most of my reloading is 9mm because I’ve got a 1000 round a week pistol habit and it’s the only way I can afford it. My advice, get one of the big name books. Hornady, Speer, etc. Then get the little book for any caliber you plan on reloading. That way you can read up on what they all say without having a 10 foot stack of books to look through as you are digesting all the information. The ABC’s of reloading should be required reading as well. 1000 9mm rounds a week! That’s awesome. Yea i’ll have to do what you suggested someday. These days, I’ve found it’s also easy enough to just go to the powder manufacturer’s website and get their charge data for whatever you’re loading. +1 for Jeff and Paranoid. Before buying any equipment, you should buy the ABC’s Of reloading. Looks like a fine example of why it’s a good idea to always wear eye protection when you’re shooting. That is a slam fire not an incorrect powder mixture; if you look at the pics on AR 15.com none of the locking lugs are torn out and the breech isn’t split, nor is the barrel ruptured. Must’ve not used mil spec primers or seated them properly. I think you should read up on what a slam fire is. Your 100 percent incorrect on your diagnosis. A slam fire just shoots a bullet through your barrel without a trigger pull because the free float firing pin hits a primer that wasn’t seated deep enough. It does not blow your gun apart. I’ve seen binary loads listed for Very large rifle calbers that utilize a small charge of pistol powder to ignite a large charge of very slow burning rifle powder. What this guy was thinking putting a binary charge in something as small as .223 is beyond me. If it’d been an AK he never would’ve noticed. Good thing it wasn’t a 45 ayceepee–it would have taken off his entire right side! To much of a powder charge excessive pressure in the chamber looks like to me. Previous post: Brady Campaign – Full Clip, Do You Wanna Mess With This?